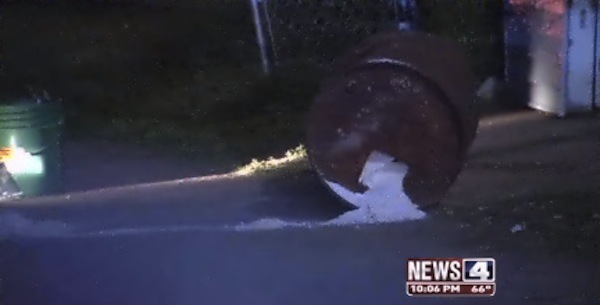 A 55-gallon drum was found, rusted and broken open, spilling it’s contents of white powder in to a St. Louis alley in Ward 11. Of course, people were frightened. What was the white powder? Is it anthrax? Have the terrorist gotten lazy and started just throwing partially open barrels out of cars after their big boss is busy floating in the ocean, which has to sting with all the salt water in that head wound. First responders cordoned off the area, tested the material and discovered that it wasn’t dangerous. It was a type of gelatin. Firefighters and police were on the scene for about three hours. Once finished, they marked the barrel as safe and contacted the health department to ask someone to remove it. Three hours to determine it’s just gelatin and when they do, they just put a sticker on it or something and left it there. They probably could have stood it up or put it in a dumpster…eh…whatever. The real question is: What can we do about any possible future rusted barrels full of gelatin? We can’t let this happen again! Won’t someone think of the children?! The mayor’s office said it’s attempting to catch people dumping trash, city-wide. Last winter, the city set up 40 hidden cameras in alleys and neighborhoods in north St. Louis to catch those illegally dumping trash. A spokeswoman in the mayor’s office said the city plans to expand the pilot program late summer or early fall with 120 new cameras. She said the cameras can be moved to different areas and the new program will help cover Ward 11, where the barrel was dumped this week. So far the pilot program using hidden cameras to stop trash dumping is going great. Except for that one time when they had almost had a perfect shot of a guy throwing away an old couch but right before he came in to frame a kid was gunned down in a drive by attempt and all we could see what the face of his killer. Total ruined the shot with more wasted footage. Makes you so angry you start to wonder if this project and all the money we had to take from the city’s orphanage was really worth it.